New rental for 2019! This two bedroom/two bath fairway condo is on second level with lovely views overlooking The Sea Trail Maples Golf Course. The condo is non-smoking and is a two bedroom/two bath floor plan with a panoramic fairway view. The condo has two bedrooms with two double beds and an adjoining private full bath. Each bedroom also has a flat panel television for additional entertainment convenience. The floor plan is open with a large common area featuring adjoining living, dining and kitchen areas. 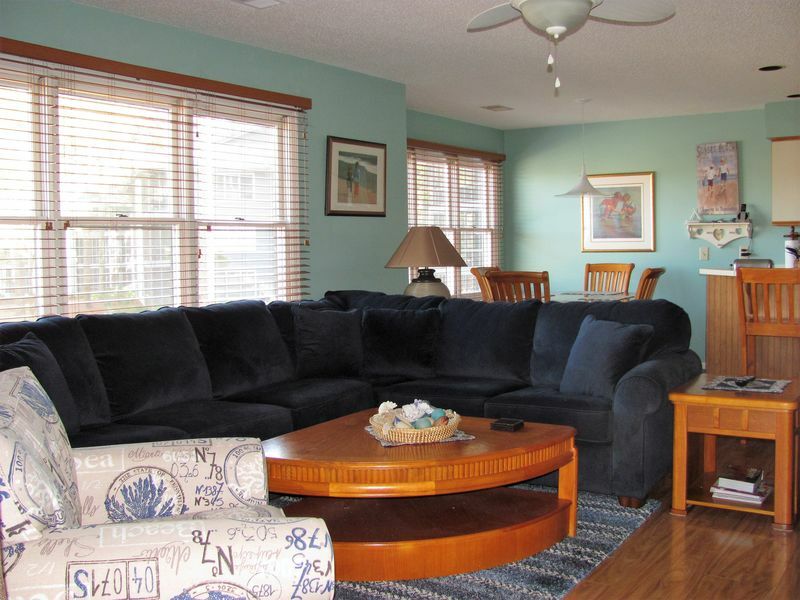 The living room features a large screen flat panel HDTV television & DVD player with comfortable furniture and opens to a large screened porch. The porch is located at the back of the condo facing the fairway and offers serenity and privacy. Views from the porch feature the scenic fairway and surrounding coastal woods . This is the perfect spot to relax after a day on the course or at the beach! The condo has central heat & air, wireless internet and a laundry area with washer/dryer. The kitchen is fully-equipped dishwasher, microwave, coffee maker, blender, toaster, full-size refrigerator and range and has a bar area for additional seating. The dining area is located next to the kitchen and has a large table with comfortable seating for four. Complimentary linens, towels and departure maid service are included for your convenience. The condo is located across the street from a recreational center within the Sea Trail community - The Village Activity Center. The Village Activity Center provides indoor & outdoor pools, hot tub and sauna. Use of the Village Activity Center is available for an additional daily fee payable directly to the facility on site.